Whether you are considering plasma treatment, PECVD or parylene coatings for the first time, looking to bring contract processing in-house, or adding equipment to keep up with increased production - give us a call to discuss your requirements. We will work with you to provide a solution that will efficiently incorporate advanced coating or surface treatment technology into your current manufacturing environment. With over 20 years of design experience, you can rest assured that all of our equipment has the quality design, workmanship and state-of-the-art technology that made PLASMAtech the leading supplier for the most challenging industrial surface engineering applications. Equally important is our commitment to ensure your success by providing superior after-sales support. 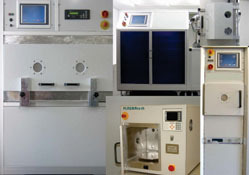 PLASMAtech offers several affordable standard system options for R&D and low to intermediate volume processing requirements - including PECVD capability. Systems can be configured with virtually any chamber configuration, parts handling features and process options to meet your specific processing needs. Ranging from small/R&D to large chamber systems for high volume parylene coating.